So the Xtreme has been around for a while now. The first one was kind of odd looking and the integrated turn indicators and the single unit tail light cluster looked like a lady with really big teeth  not very attractive. Thankfully, with the changes that the bike got over the last few years, the ugliness issue has been sorted. The latest avatar gets a 'Sports' attached to its name and for a change, the updates aren't just skin deep. The Xtreme has been slowly moving away from the bikini-faired-150 look that was kicked off by the CBZ many moons ago. The Sports is the latest iteration of this design direction and in comparison to the previous model, the fairing has gotten even more minimal and is now headed towards a more street-naked look. What I'm trying to say is that the new Xtreme looks really smart. The new shape tank and panels look good too. It's got a new smooth aggression to it that checks all the right boxes in my book. The bike even gets a new belly pan and a two-step seat. What I'm not a fan of is the bit of plastic that covers the top triple clamp. It seems like an afterthought intended to cover up for some lack of design work. The same applies to the inner plate on the front brake rotor. It just seems like a lazy job. As far as features go, there isn't a lot going on on the Xtreme. 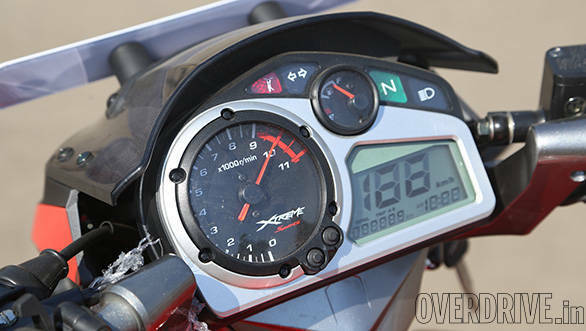 The Megatron instrument cluster has been replaced by the more traditional unit from the older Xtreme. I wasn't a big fan of the overly-busy design of the older one, so this one works for me. 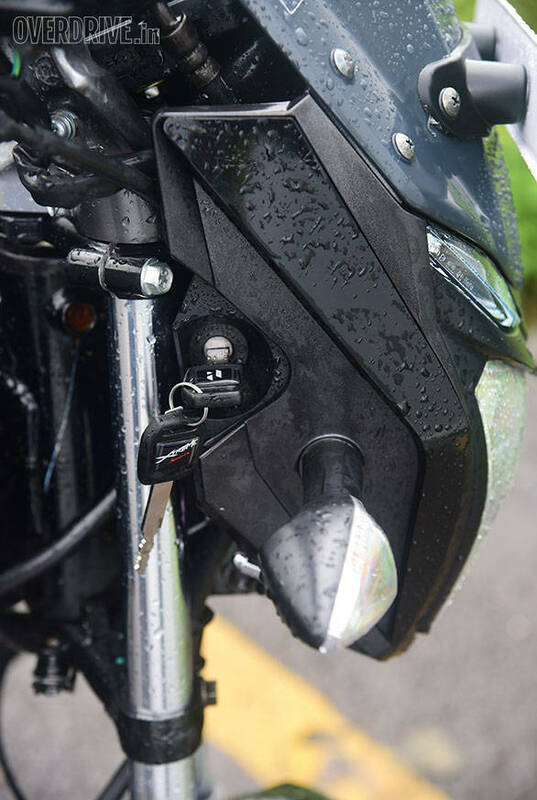 Aside from this, the bike gets an optional disc brake and 5-step adjustable suspension at the rear. 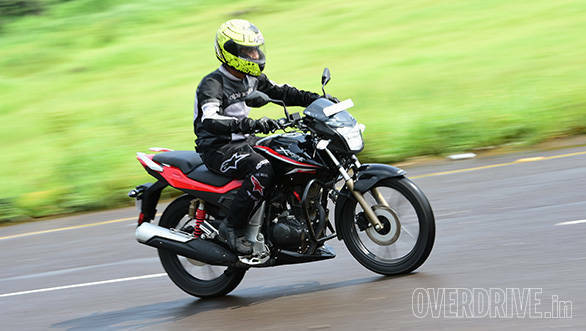 There isn't a lot more in terms of features and the bike is a pretty standard 150cc affair. What I still don't understand is why the ignition control has moved to the right side of the fairing. It isn't exactly cumbersome, but it's just weird and sort of a reinventing-the-wheel move. The Heros have always been a lot more softly sprung when compared to the new crop of 150s. So when you compare it to, let's say, the Gixxer, the suspension is quite soft. What this means is that while the ride is quite nice, handling suffers a tiny bit. The front end tends to take a nosedive for the ground under hard braking and the fact that the tyres aren't all that great doesn't help either. The fact that the bike takes 15.11m to come to a stop from 60kmph is down to the tyres as well. The brakes by themselves don't lack feel. But you can feel the tyres are about to be overwhelmed. And despite all this, 15m is not a bad brake test figure at all. As I said before, the Xtreme's suspension is a lot softer than its newer contemporaries. But this is not to say that the bike misbehaves when ridden spiritedly. It might not be as fun to ride as the newer 150s (it is a really old chassis afterall) but you can still push it reasonably into corners and as long as you're not getting carried away, you can have fun. 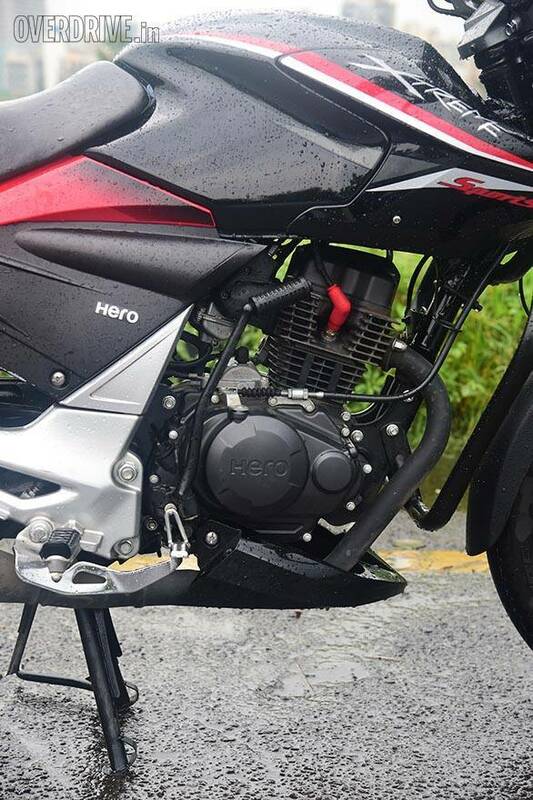 The Hero uses the tried and tested 149.2cc motor that is from Hero's Hero Honda days. What Hero has done is retune the motor so that the compression ratio has gone up from 9.1:1 to 10:1. In the process, the output from the engine has gone from 14.4PS and 12.8Nm to 15.4PS and 13.5Nm. This means that the Xtreme Sports hits 60kmph in 6.2 seconds and 100kmph in 25.9 seconds. There is a noticeable increase in low-down torque even though the power dies out towards the top-end of the rev-band. I managed to see 114kmph on the speedo which is 111kmph on the Vbox. The downside to the added power though is that the engine doesn't feel as refined as the older motorcycle. There are some vibrations that creep up from the pegs and bars and the motor feels a little more stressed than before. But the vibrations aren't too much to complain about because aside from the small drop in refinement, nothing else has gone wrong with the motorcycle. In fact, the fuel economy is pretty decent too. The Xtreme Sports returns 48kmpl in the city and 62.3kmpl on the highway. This adds up to an overall figure of 51.6kmpl which is fairly reasonable efficiency considering the bump in power. 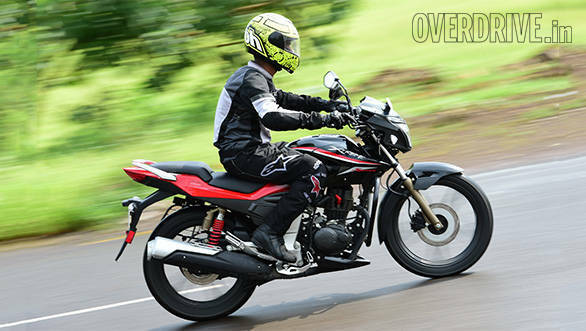 The Hero Xtreme has always been a great 150cc motorcycle to boot around town. 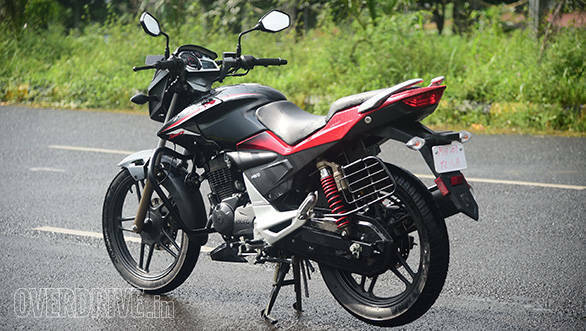 With the added power and the Sports in the name, the Hero has become better at what it does  providing a reasonable way to commute quickly around town and also do the occasional highway run. Also, personally, I feel the update in tweaked looks has made the bike a lot prettier to look at. Overall the situation is one of a good deal becoming better. 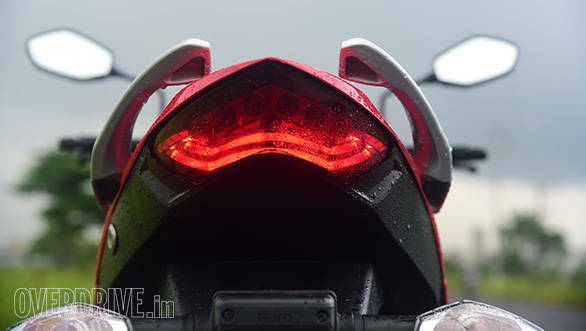 So for Rs 72,787 (ex-Mumbai) for the rear disc-braked variant, the Hero Xtreme Sports isn't a bad deal at all. 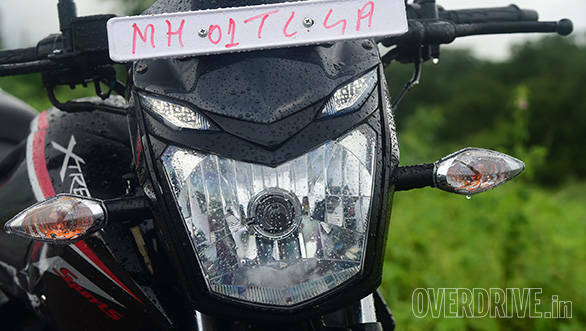 Only problem is, the 150cc segment has some more exciting motorcycles vying for the top spot. The Hero just might get lost in the fight there.